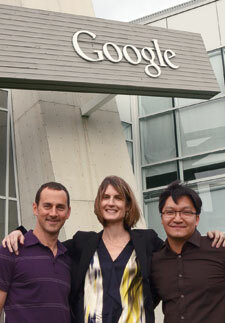 Google's mobile advertising team includes, from left: Jason Spero '99, Jesse (Marmon) Haines '03 and Paul Feng '04. By the end of this year, more than half of all Americans will have a smart phone. This trend presents a lucrative opportunity for Google’s advertisers — and for Google itself. In late 2010, the company decided to seize the opportunity to communicate where mobile advertising was going, what it could do for advertisers and how Google could help. It was no easy feat, and it could not be accomplished alone. Spero and fellow Kellogg alumni Jesse (Marmon) Haines ’03, group marketing manager, and Paul Feng ’04, group product manager, collaborated to plan “thinkmobile,” a half-day conference in February geared toward Google’s top advertisers. Though Feng and Spero were based in Mountain View, Calif., and Haines in New York City, the trio talked every day on a virtual platform to plan a program to convince advertisers to invest more in mobile ads. “We had to get the right people in the right room and package the right messages about mobile advertising that were going to be sticky and resonate with the audience,” Haines says. Hundreds of Google’s advertisers attended thinkmobile, while thousands of additional viewers watched a live stream of the event on their desktops and mobile devices. All three of the Kellogg graduates were featured speakers. Feng says Google’s mission — to organize the world’s information and make it universally accessible and useful — is inspiring to employees. So do many of the other Kellogg graduates at the company (Google employs more than 100). Global business head Bill Sickles ’94 partners with large companies and provides them with marketing solutions across Google products, including YouTube, display and mobile ads. He says the teamwork skills he learned at Kellogg fit right into the Google culture.